Tuesdays: 4:00 p.m. - 7:00 p.m.
Wednesdays: 7:00 a.m. - 12:00 p.m.
Saturdays: 7:00 a.m. - 1:00 p.m. The Glenwood City Recycling Center is located at 221 Water Street, Glenwood City, WI 54013 across from the community center. An ID card is required and may be obtained from the Town of Forest Clerk. Remember to bring your Recycling Center I.D. card with you to the center. 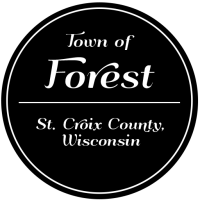 Town of Forest residents is allowed to bring recyclables only, NO GARBAGE MAY BE DUMPED at the recycling center. Glass is acceptable in green, clear and brown colors. No window glass, mirrors, etc. Any metal caps, cap rings, foil or any other foreign material must be removed from the glass. Glass bottles must be free of sand, dirt and rocks. Glass must be reasonably clean. It is not necessary to remove glued on paper labels. Foil must be removed. Tin cans can be both whole or crushed and reasonably clean. Labels need not be removed. Carboard can be either whole boxes or flattened. Waxed cardboard, cereal boxes, shoe boxes, pop or beer cartons are not acceptable at the present time. All newsprint is acceptable and can include magazines. Paper must be in bags or bundled. Acceptable plastics include PETE (#1) and HDPE (#2). Containers must be empty and the caps removed and reasonably clean.